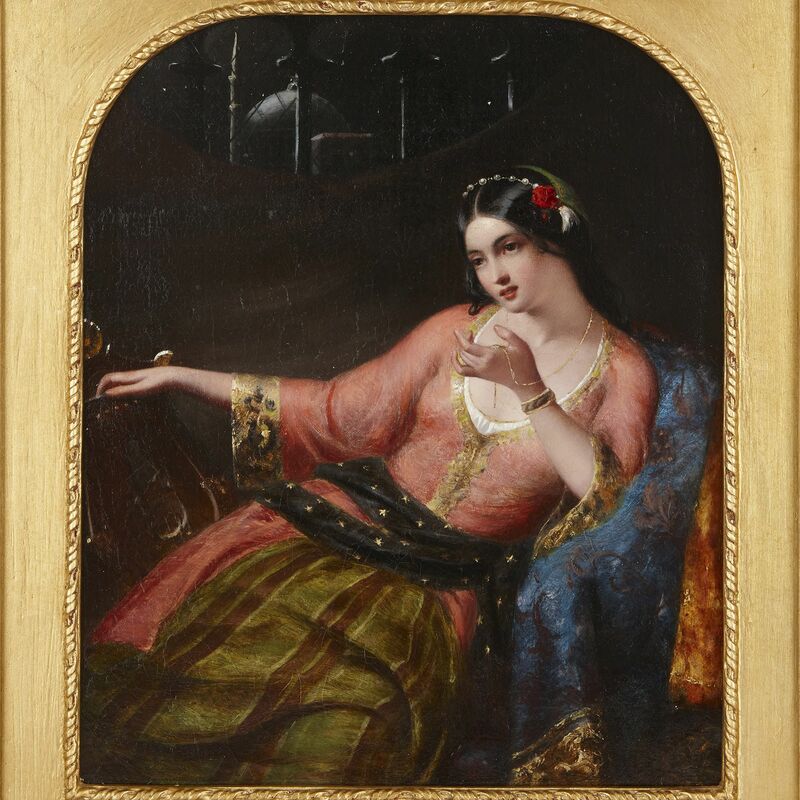 This beautiful depiction of a Turkish woman in a harem was painted by the famous Victorian painter and Associate of the Royal Academy, Henry Nelson O’Neil. 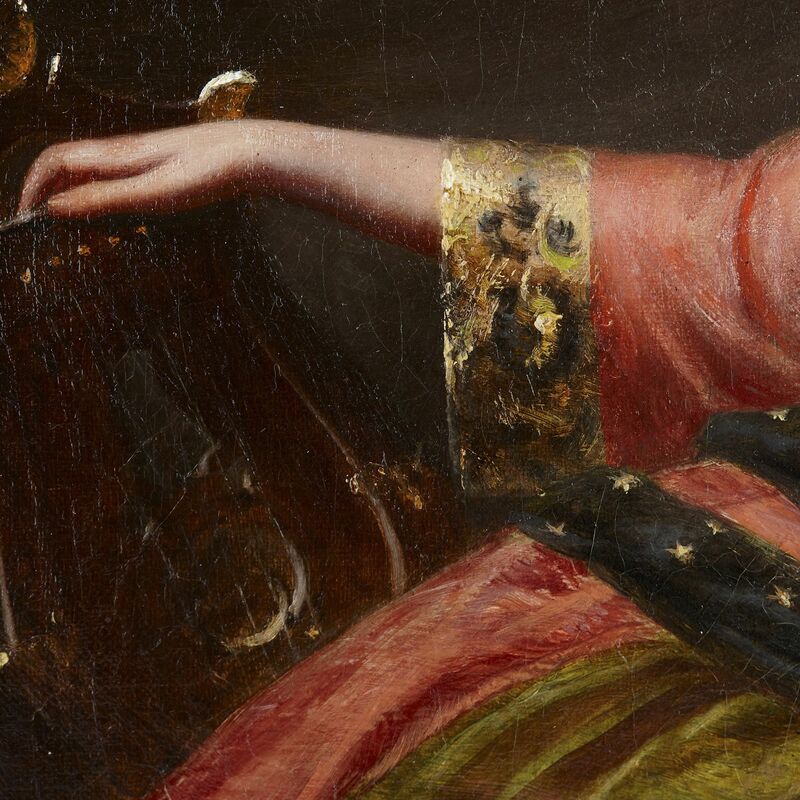 The oil painting depicts a woman in Turkish dress, reclining on a seat that is draped with embroidered blue fabric. The woman holds onto a fine gold necklace, which is tied around her neck, with her left hand, and rests her right on a stringed musical instrument. She wears pearls and a red rose in her dark hair, and is dressed in a gold-lined light pink jacket and brown-striped green skirt. A black sash, which is embroidered with gold stars, is tied around her waist. The woman gazes off to the right, a faint smile playing on her face. Short, well-blended strokes of paint have been employed to naturalistically render this scene. The woman’s delicate features, her jewellery, and the fabrics she wears, have been skilfully portrayed. Furthermore, the woman’s fair skin and colourful clothing are made to stand out against the dark background. The picture is displayed in a carved giltwood frame, which features a title plaque, reading ‘In The Harem/ HENRY NELSON O’NEIL – ARA/ 1817-1880’. 'In the Harem' was created by the Russian-born artist, Henry Nelson O’Neil, who was based in England in the 19th Century. O’Neil entered the Royal Academy Schools in London in 1836 and he began exhibiting with them two years later. 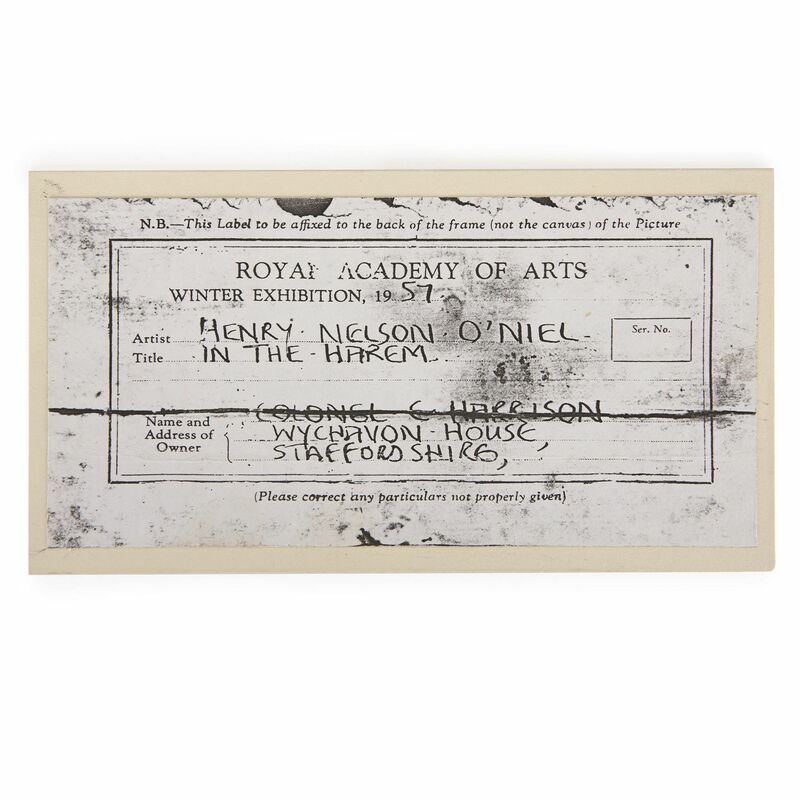 A piece of paper attached to the back of the painting records how O’Neil exhibited a total of 142 works, including 94 at the Royal Academy between 1849-1879. His most famous paintings include ‘Eastward Ho’ (1857) and ‘Home Again’ (1859), which depict the departure and return of troops to India following the Indian Rebellion (or First War of Independence) against the British Empire. O’Neil was made an Associate of the Royal Academy in 1879. 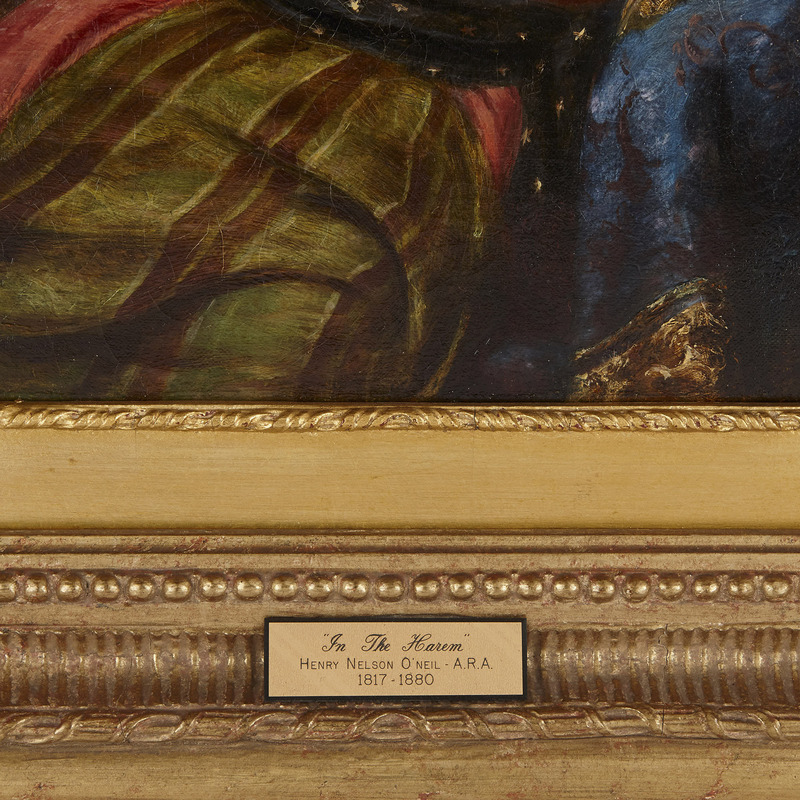 A second label documents how this painting, ‘In The Harem’, was exhibited at the Royal Academy’s Winter Exhibition of 1957. 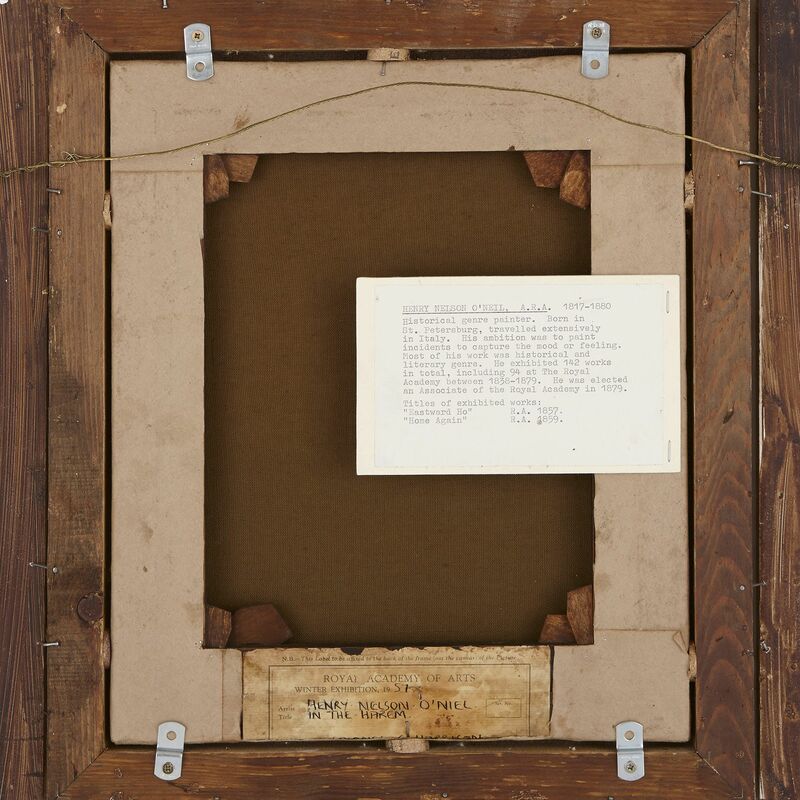 Exhibited at the London Academy, Winter Exhibition in 1957. 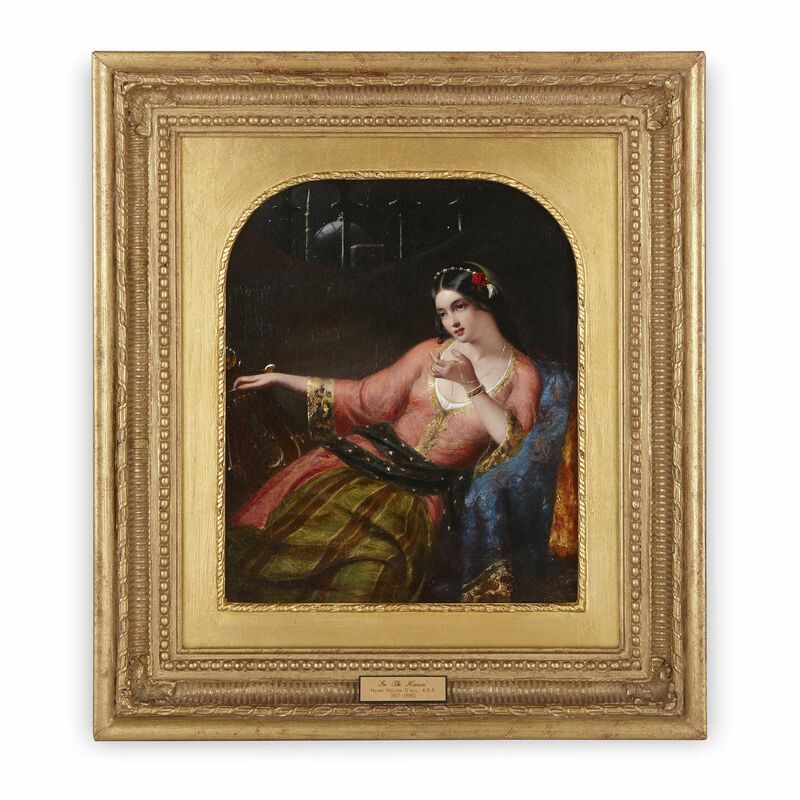 Similar paintings have been sold at Christie's, London sale 30 November 2001, 'The Sultana' (lot 63), and Sotheby's, London sale 11 December 2007, 'Head of An Eastern Beauty' (lot 22A).